On Oct 23, 2016 I had the privilege of riding in the Bike MS: NYC which was a 30 mile route around Manhattan. NYC is another area I haven’t been to in YEARS and I was disappointed I didn’t get to do as much sight seeing as I wanted, but that just means another trip back – preferably when it’s a bit warmer! The MS City to Shore 2016 ride is now complete – for me anyway – as I write this there are quite a few cyclists crazy enough to bike all the way BACK to the start. Who knows maybe I will be one of them someday, but for now the 80 miles from the PATCO station in Cherry Hill, NJ to Ocean City, NJ is a perfect ride for me. Kevin was kind enough to wake up early and drive me to the beginning – it was of course organized chaos with so many cyclists eager to get on the road. There was plenty of parking when we arrived and I loaded up my bike with everything I needed for the day and headed over to the start. I was there at about 6:15, skipped walking around the tent area and was lucky enough to get into the last chute before they closed it off and then the rest of the cyclists had to wait in line until they started releasing the (maybe) 7 or 8 chutes they had set up. Then those waiting would fill the chute just released and wait until all the other chutes went, then it was their turn. So I was lucky to get in the last chute of the first batch. The first wave started off at about 6:30 or so and then we would wait until the all clear for the next chute to be released – this was approximately every 5-10 minutes. They have been doing this ride for a VERY long time and it is a major event so they have this down to a science. 7,000 people sign up every year and it is so well organized it’s remarkable! some of the 7,000 cyclists ready to go! City to Shore T-3 Days!! So the MS City to Shore bike ride is right around the corner – just 3 days away! I just wanted to thank everyone who donated to the cause – I actually raised enough money to ride in the MS City to Shore AND the MS NYC in October! SO THANK YOU!!! 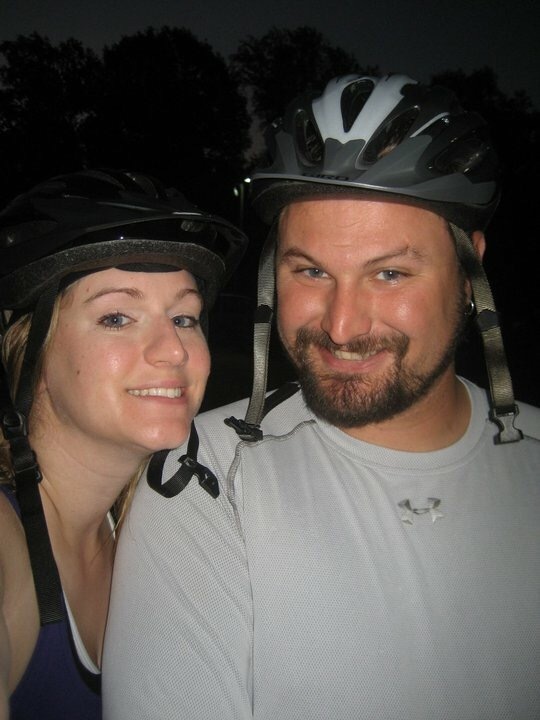 In 2009 I attempted to ride 75 miles of the MS 150, but just wasn’t prepared enough to finish. In 2010 I was back with a vengeance! Kevin decided to do the ride with me – we both signed up for the 75 mile route. We got padded bike shorts (what a difference!! ), trained, and Kevin even got a new bike! We pulled into the parking area EARLY and were within the first few waves to leave. Since there are so many people doing this ride, they let groups of riders go, spaced out by a few minutes. It was amazing how FAST some people can ride – Kevin and I both commented on that – I mean it seemed like there were people who were in worse shape than us just FLYING by us – we didn’t get it! Did they have better bikes? We were both on hybrids. It just felt like the WHOLE time, we were pedaling like crazy and people would pass us who were definitely not pedaling as much as us but going so much farther faster. I understand the people with road bikes with the clip in shoes, but other than that it was strange! Well I did it! I signed up again for the MS 150 City to Shore. I have done this ride twice before – well let me rephrase that, I have attempted this ride twice before and completed it once. The MS 150 is an epic charity bike ride which benefits Multiple Sclerosis – it starts in Cherry Hill, NJ and goes all the way to Ocean City, NJ. There are literally THOUSANDS of people that come to ride this event of all different abilities – it is quite overwhelming to see! Of course, you don’t have to ride the whole 150 (if you do, that’s split up into a 2 day event.). There is also the 100 mile century ride, the 75 mile ride which is the ride I sign up for (which is listed as 80 miles this year), a 45 mile and a 25 mile – so there is something for everyone! There are also MS cycling events a lot of different states across the US.